Beekeeping can be a fun hobby as well as a profitable business, whether you are just raising bees for your own use or plan to sell honey and beeswax or rent the hives to help local farmers and gardeners pollinate their crops. But how do you get started with bees? It takes more than just a healthy hive to get started with bees, but with these easy steps, anyone can become a knowledgeable and productive beekeeper. While beekeeping is gradually becoming more widespread and acceptable even in urban areas, it is wise to investigate local laws about whether beekeeping is allowed and what restrictions might be in place, such as limiting the number of size of hives or their placement relative to common or public areas. Also check any homeowner's association restrictions that might apply to beekeeping before putting in the effort to start your hive. There is a lot to learn about keeping healthy bees and a productive hive, and you will have better success if you study before you get started. Visit other local beekeepers or join a local beekeeping group, read how-to beekeeping books and take advantage of online resources to learn all you can. There may also be local classes you can also investigate that offer hands-on experience with getting started beekeeping. While it isn't strictly necessary to talk to your neighbors before you start beekeeping, it is courteous, particularly in urban or suburban areas where yards are more compact. Ask if any neighbors have allergies to bee stings so you can take precautions with where to place your hive, and let the neighbors know about the benefits they will see from your bees – better fruit, flower and garden pollination to start! There aren't too many supplies necessary to get started as a beekeeper, but having the right gear will make the process easier, more comfortable and more productive. Choose not only the right size and style of hive, but also the essential protective clothing you will need to tend the hive, as well as tools to access and care for the hive appropriately. Where you position your hive can have a great impact on the bees' productivity. Choose a relatively sheltered spot with an open flight path for easy access, and be sure there is a water source nearby – a small pool or shallow basin will work just fine. Putting the hive in an area with morning sunlight will encourage the bees to be active earlier, but avoid full sunlight that could overheat and kill the bees. There are several ways to buy honeybees. Online retailers can offer a good selection, and local beekeepers with well-established hives may be willing to sell some of their population. Nurseries and garden centers may also have bees for sale in the spring, but supplies often sell out quickly and it is important to be ready to buy your bees right away. Bees need very little maintenance once the hive is established and active, but a conscientious beekeeper will check the hive and be sure there are no problems at least once a week. Be sure bees have access to water, and minimize the use of any pesticides, herbicides or other chemicals that could contaminate the hive. In cool climates in early spring, it may be necessary to provide bees with supplemental food, and it is always a good idea to plant nectar-rich flowers in the yard for bees to visit. Once the hive is established, the honey will begin flowing. 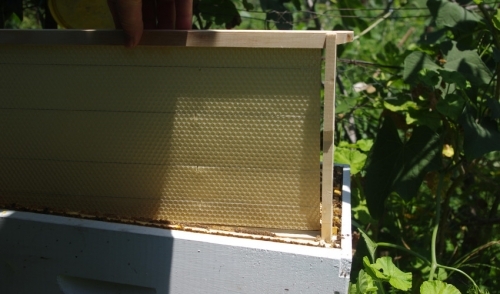 Small hives may only need harvesting in fall, but a larger hive could produce much more honey and need harvesting more regularly. Don't forget to harvest not only the honey, but also the beeswax and honeycomb structures, all of which can be of great use. Stings may be a natural part of beekeeping, but by following the proper steps to get started with bees, no beekeeper needs to get stung by unfortunate mistakes before they are able to enjoy their honey harvest.